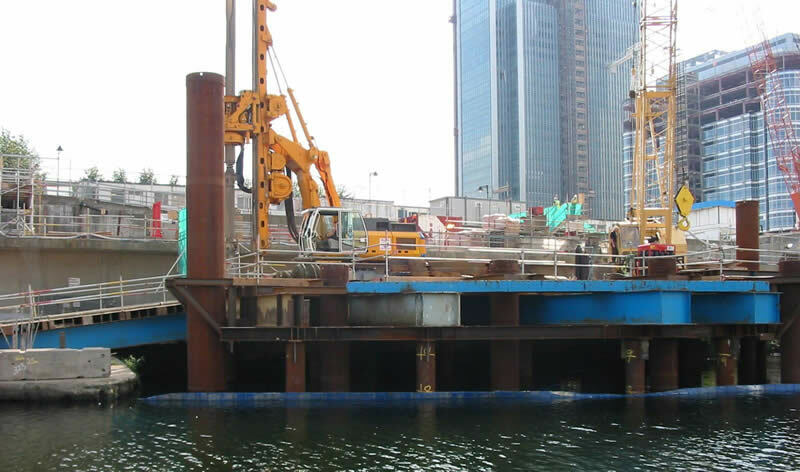 The construction over standing water, some 12 metres deep, of a cantilevered reinforced concrete deck, some 2,100 square metres in area, supported on bored insitu concrete piles, to carry a low-level extension to an adjacent high rise building in the Canary Wharf area of London Docks. The contract was under Canary Wharf Contractor's Design & Construct Conditions and was designed in conjunction with Doran Consulting. The provision of a temporary construction platform which included the driving of some 20 No. 508mm dia steel tube piles into the dock floor, using an 80 tonne crawler crane and vibro hammer mounted on a floating platform. The working platform consisted of a steel deck, constructed from 305mm deep UB sections, carried by 610mm deep UB cross heads on 914mm deep UB main beams. This platform was built to easily carry an 80T piling rig and 80T crane together to complete permanent works. The picture shows the 80t crane and 80t rig both working from the working platform. The other picture shows permanent casings being installed from the working platform. Piling for the permanent structure consisted of 40 No. 1050mm dia. steel cased bored insitu reinforced concrete piles driven from the temporary platform to a set some 35 metres below deck level. 33 No. of these piles were driven through standing water some 12 m deep and the remaining 7 No. were driven into existing ground adjacent to the dock. Beams and an insitu structural slab tied into the adjacent BP1 structure and the existing dock wall. A total of some 1,500 cubic metres of concrete and 400 tonnes of reinforcing steel were used in the structure. 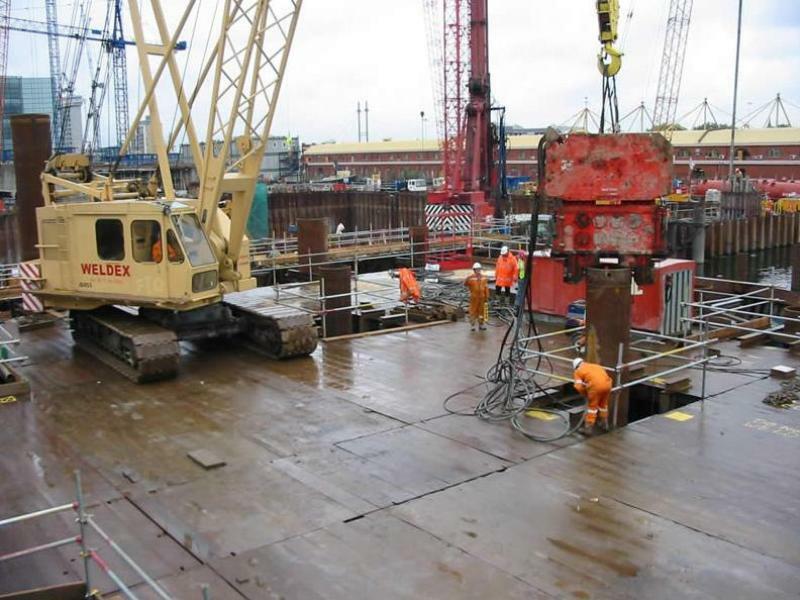 In order to bring services into the new structure from across the dock, two rows of sheet piles were driven into the dock floor, the top of the piles finishing 4 metres below water level in order to maintain a navigable channel for river craft. A trench was then excavated between the sheet pile walls by long-reach excavator, and a prefabricated steel cable duct pipe laid across the dock. The trench was then backfilled to dock bed level and the sheet piles cut off by divers.